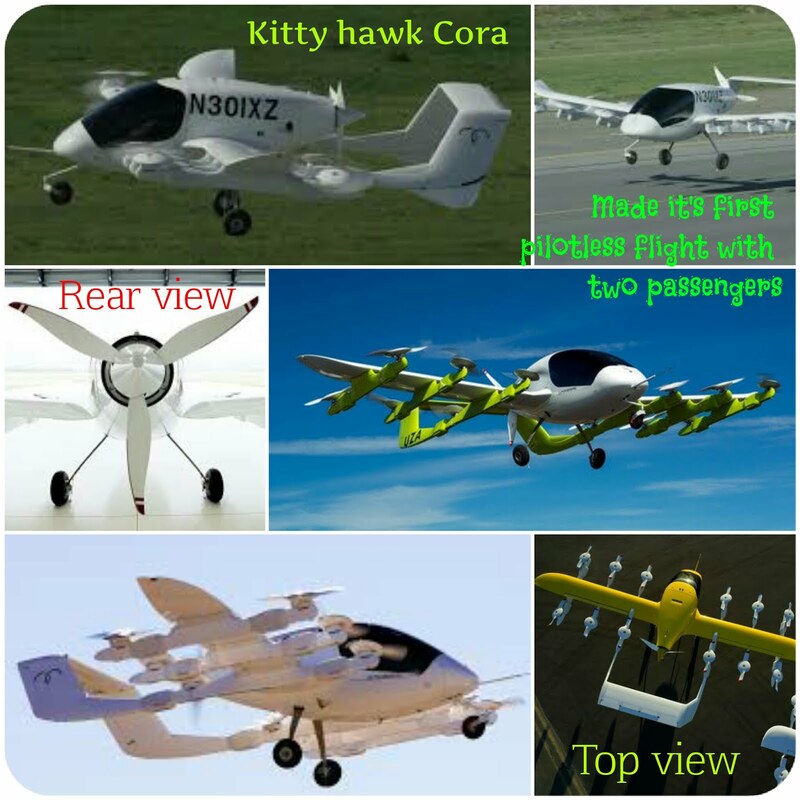 Kitty Hawk Cora, image courtesy Kittyhawk..
Kitty Hawk Cora - the latest flying taxi service plane to hit the global market. There are 12 rotors (electric fans), six on either side, three in front of the wing and three behind the wing, all independent and one propeller in this pilotless VTOL aircraft. It can fly at an altitude of 914 metres This 11 m wingspan autonomous flying taxi is promoted by Alphabet CEO Larry Page and Google VP Sebstian Thrun who is also the CEO of KittyHawk..
Click here for the original youtube video ..
Cora is assigned by Google to be classified as an air-taxi service. It can carry two passengers , is pilotless, and can travel at speeds of upto 150 kms per hour and travel distances of 100 kms. 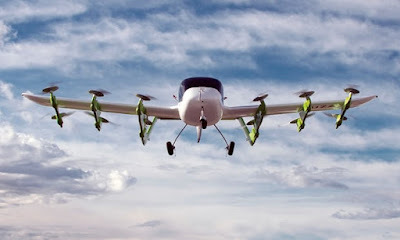 KittyHawk's frustration with the US Federal Aviation Authority (FAA) resulted in Kittyhawk making its first flight in New Zealand which was more than willing to test this innovative pilotless two seater all electric plane. Cora in the air, courtesy Guardian. The 4.7 milion population New Zealand has now become the new Kittyhawk. The original Kittyhawk in North Carolina was where Wright Brothers made the maiden flight of their small aircraft,the Wright Flyer in 1903, the 12 m span plane whichn could fly at max 48 km/h speed and worked on reciprocating engines. Autonomous flying taxis would revolutionise small distance travel around the world on land or across islands but not across large seas and oceans. Being able to hail an airtaxi ride using a Uber like app by 2020 would redefine air travel around the world.